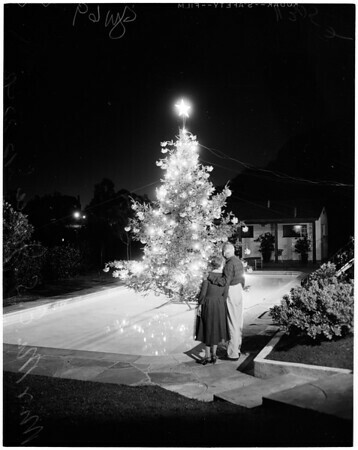 Night Lighting of Christmas Tree in swimming pool, 5745 Hill Oak Drive in Hollywood Hills, 1954. Caption slip reads: Photographer: Wyman. Date: 1954-12-22. Reporter: Sid Bernstein. Assignment: Night lighting of Christmas tree in swimming pool at home of E. S. Jones, 5745 Hill Oak drive in Hollywood Hills. Mr. and Mrs. E.S. Jones survey their tree. Tree without Joneses. Tree 32 feet tall, 100 lights".